“When life gives you rocks,” Ahhh…Ras Natango Gallery and Garden‘s Tamika Williams said, “you make a rock garden!” That’s exactly what Tamika and her husband Ian Williams did with the half acre property they bought 25 years ago. Now, it’s a beautiful garden and gallery, a prominent eco-tourism spot in the small community of Camrose, near Montego Bay, and a fine example of “community tourism” at work. The idea behind community tourism, which was pioneered in 1978 by local tourism consultant, Diana McIntyre-Pike and Desmond Henry, a former director of tourism, is to use tourism to promote sustainable development in rural areas by bringing visitors to communities where they wouldn’t normally go so that they’d explore and enjoy local resources and talent and meet Jamaicans where they live. I visited Ahhh….Ras Natango Gallery and Garden earlier this year and heard from Ian and Tamika how they had transformed their piece of rock into their own idea of paradise on earth and got the community of Camrose involved by employing young people, working with the local schools by teaching students art, crafts, how to tend a garden and the benefits of composting. Their story is one of courage and determination, despite the odds, to breathe life into a vision. I wrote about the couple and their garden yesterday but I wanted to share some of the flowers and other items I saw for today’s Travel Photo Thursday. Enjoy! Rock painting of three of the eighteen endemic species that can be seen at Ahhh…Ras Natango Garden and Gallery. Twenty-four species are endemic to Jamaica. Ahhh…Ras Natango Gallery and Garden is located in Camrose, St. James, about 20 minutes from Montego Bay. Entrance $30. A free shuttle service is available from town. Hours – 10:00 a.m. to 6:00 p.m. on weekdays; on weekends by appointment only. 876-578-2582. When Ahhh….Ras Natango Gallery and Garden’s Ian Williams, aka Ras Natango, first saw the property that would eventually bear his name, he was looking for a place where he and his wife, Tamika, transplants from Kingston, could put down roots and raise their young son. After a bit of negotiating, he bought it on spot, telling Tamika about it only when he returned home. If he expected high fives, he was wrong. She needed more than a little convincing. You see, the property he bought is tucked into the side of a hill, about 2,000 feet above sea level, with rocks everywhere, some the size of boulders. And it presented its own problems — like how to build on rock and, equally as important for Tamika, then a teacher and an avid gardener, where to put her garden. But Ian, the artist, had a vision and eventually, he won her over. They began slowly building their home, which clings like tentacles to the hillside, starting from the top and adding space below, as needed and funds allowed. When one of the guests at the hotel Ian worked asked to see where he found his inspiration, he realized he needed a studio, and Ras Natango Gallery was born. Ian and Tamika continued working and sculpting the land for their use. To create the garden, they terraced and backfilled the hillside with compost, and planted flowers that would thrive in shallow beds. Soon lantana, bougainvillea, gladioli, heliconia, hibiscus, zinnia, nasturtium, convolvulus, torch ginger, ginger lily, beehive ginger, cosmos, sunflower, amaryllis, lantana, bromeliads, and several other varieties bloomed. They added fruit trees (mango, guava, cherry, naseberry), and planted herbs and vegetables as well. The quiet charm of Falmouth Jamaica lies in its commercial buildings as well as its residences. Modest or grand, they offer a glimpse into a bygone period, a time when sugar was king. In first part of the tour, we looked at some of Falmouth’s commercial buildings. For the second part, we’ll view some of the private homes that are located on Trelawny and King Streets. Both parts of the tour can be done together and will take about 2-3 hours to complete. To start this tour, turn right after leaving the pier and follow Trelawny Street. When you cross Market Street (the Baptist Manse is at the corner of Trelawny and Market), we’ll arrive at our first stop on Trelawny Street. Several of the homes we’ll see were owned by free people of color. During the 18th century, Jamaica had a sizable population of free people of color, who generally lived in the urban areas. Though the majority was poor, a good number accumulated considerable wealth. Just behind the Baptist Manse is this well preserved home that once belonged to and is believed to have been built by Isaac Love, a mulatto mason. Love purchased the lot in 1781 from Edward Barrett. Located next door to the Love House, this property is now being used by the Department of Corrections. I don’t know its background but judging from its design – 2 stories, brick, quoins, the archway, the verandah with fretwork – I’m guessing it could have been built in the 19th century. Across the street from the Love House is this two story brick house. Construction date unknown. Cross King Street and you’ll arrive at 8 Trelawny Street. The storyboard outside the house describes Elizabeth Somerville, its original owner, as a free woman of color. She was one of the first women of color to buy property in Falmouth after Emancipation in 1834. The house, constructed of wood, is typical of the houses that were built by free people of color around Falmouth. It had two rooms of similar size that were separated by a partition wall. The front room was probably used as a sitting and bed room, the back a waiting and sitting room. Since the house was made of board, cooking would probably have been done outside or in a separate structure away from the house. Go north on to King Street to see this sweet little house. Another typical Falmouth house, it has been renovated. The outside has been coated with sand, to protect it from fire. 9 King Street was originally owned by Richard Barrett Waite, who was probably related to the Barrett family. It was likely built in the 1800s. It has a hip roof, tray ceiling and partial wrap-around verandah. North on King Street, near the edge of the pier, is the Davidson House, which was owned by Mary Gairdner, a free woman of color. Gairdner was an extensive landowner in Falmouth. By her 1837 will, Gairdner deeded her “Creole” house to her son, Thomas Davidson, and provided that each of her four children were to remain in the houses in which they were living at the time of her death. The Davidson House is now privately owned. At this point, we can retrace our steps to the pier. I’ll be bringing you more of Falmouth in other posts. This building has captured my interest for about a year. At first, I thought it was a restored Georgian because it’s near Half Way Tree in Kingston where a few other Georgian buildings, like the St. Andrew Parish Courthouse, the St. Andrew Parish Church and the Oakton House are located. I consulted friends and family in Kingston, heritage and restoration professionals and architects but months later, I was no further along than when I started. Finally, after posting it on Facebook, I got a nibble. A few people said it was in private ownership but nothing on the backstory. For example, was it a restored Georgian, like I thought. If it is, what was there before, are there photos, etc. I’m still curious about that and will update this post if I find out. In the meantime, I decided that it has either borrowed from or retained certain elements that made me think Georgian. For example, the quoins (those are the white blocks at the corner of the building. Quoins are one of the main features of Georgian architecture. They’re usually larger and more prominent than the surrounding blocks. ), brick construction, the columns, and what appears to be a modified hip roof, a roof with sloping sides and ends that’s distinctively Georgian. Georgian architecture was popular in Jamaica between the 1750-1850. It was named for the architectural style that was all the rage in England during the reigns of King George (I, II, III and IV, 1714-1830) and features simplicity in form, symmetry and balance. The style was adopted by wealthy plantation owners for the homes and commercial buildings they built in Jamaica and the colonies, with modifications, such as louvres, verandahs, etc., to suit the local climate. The Jamaican Cherry has red, sometimes yellow skin, is yellow inside and has two to three small oval seeds. It is slightly sweet, slightly tart and juicy, and is used to make juices, or washed and eaten just picked from the tree. The cherries are low in carbohydrates and are packed with vitamin C, vitamin A and folate. The Jamaican Cherry is native to the Caribbean, southern Mexico, Central America and south to Peru and Bolivia. But it has also been found as far away as India and the Philippines. The Jamaican Cherry is known by several names, including Panama berry, Singapore cherry, and manzanitas. The Jamaican Cherry is also a flowering tree. The flowers can be used as an antiseptic and also to relieve headaches and colds. I took this flower, which I’ve magnified several times, around November. Since then, there has been two crops of fruit – cherries are in season again. The trees are beautiful in season with specks of red peeking out from among verdant green leaves. The fruit can be picked individually or shaken from the tree, which typically grows no more than 6 or 7 feet tall. And since the trees are not very large, they can be found in the backyard gardens of most Jamaican families. During the season, it’s possible to get dozens of cherries – more than enough to juice. I usually freeze them and use them sparingly until the next crop. For color, I add some to my homemade fruit juices. The Jamaican cherry is in season now so if you’re visiting or planning to visit soon, you should try the fresh juice. Ask at your hotel or guest house if there’s some on the menu, or if they can get some. I know some of the smaller establishments will gladly oblige. The juice is quite easy to make. Put cherries in a blender, add enough water to cover the fruit and blend. (You can also add a bit more water if the juice is too thick.) Strain, add a little nutmeg, lime or ginger, and sugar to taste. Serve over ice or chill before serving. If an order was delivered to you in error, would you keep it? That was the question the residents of Hanover had to answer when they received this clock instead of the one they ordered. The mistake wasn’t theirs of course. It seems that the captain of the ship that was taking the clock they received, a gift from Germany to the people of the island of St. Lucia, got confused and delivered it to Lucea instead of St. Lucia. It was an honest mistake on the captain’s part. Lucea, the capital of the parish of Hanover, had been known at various times as Sant Lucea, St. Lucia, and St. Lucea. I’m not sure what it was being called then but I can easily see how the captain could’ve become confused, especially since Jamaica was probably better known than St. Lucia. Unfortunately, for the St. Lucians, the people of Lucea fell in love with the clock, which was designed to resemble the helmet worn by the German Royal Guard, and decided to keep it — the one they had ordered was more modest — and took up a collection to pay for the difference in cost. A German landowner paid for the tower and the clock was installed in 1817. It is an eye catching landmark that seems has been watching over the town of Lucea for almost 200 years. 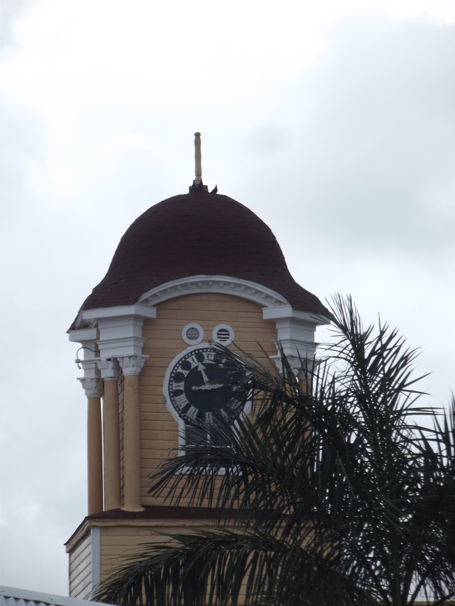 No word on what the St. Lucians thought of the Hanoverians’ highjacking of their clock or if theirs still stands. While most towns in Jamaica still have their clock tower, none has as fascinating a history as the one in Lucea. This week, I’m also linking up with the Friday Daydreaming series organized by Becca at Rwethereyetmom. Hope to see you there! 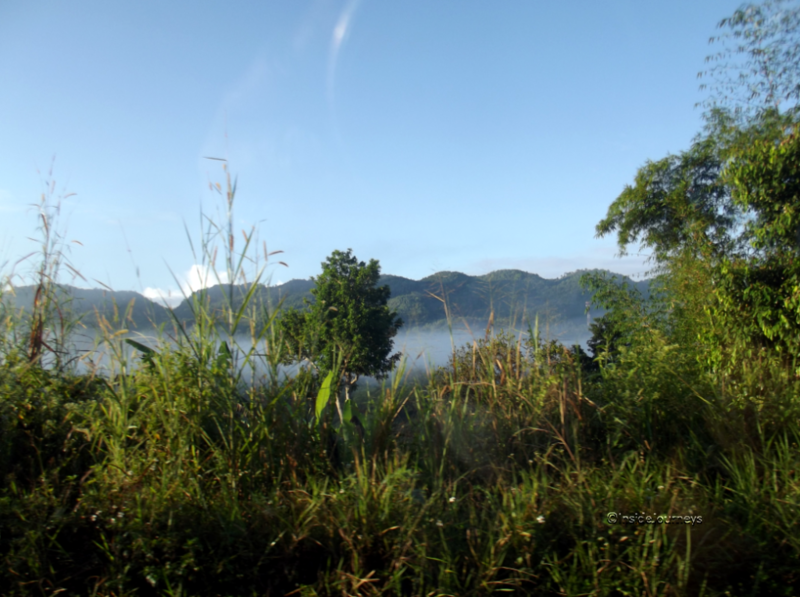 I love road trips and in December, I took a few which brought me into the interior of Jamaica. Here are a few photos of what I saw. We left early on the morning of the first trip. The air was fresh and cool and as the sun grew higher above the St. Elizabeth hills, it began to burn off the mist that had covered the mountain. 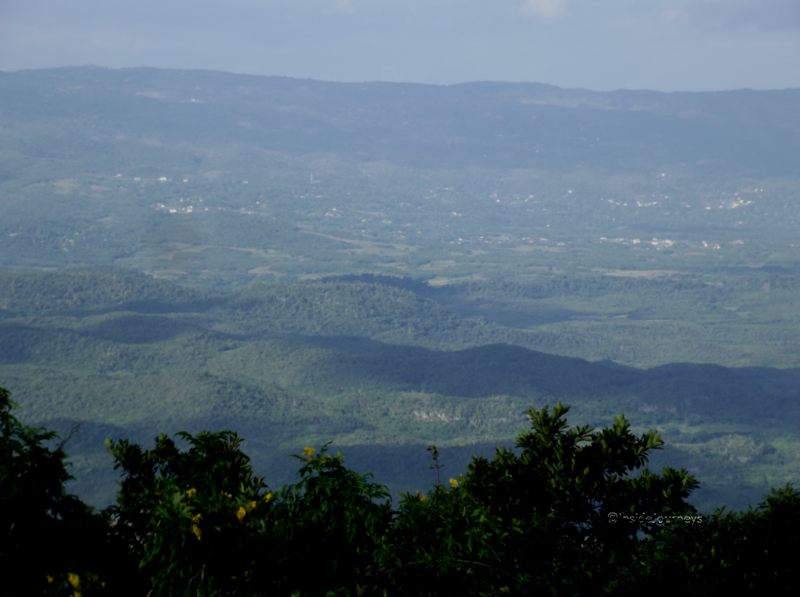 Rising more than 2,000 feet up the Don Figueroa Mountains in Manchester, Spur Tree Hill offers breathtaking views of the lowlands of St. Elizabeth and Manchester. Spur Tree got its name from the ‘spurs’ that were thrown out by the giant cotton trees that used to grow in the area. The undulating terrain in the middle marks the distinctive Cockpit Country. 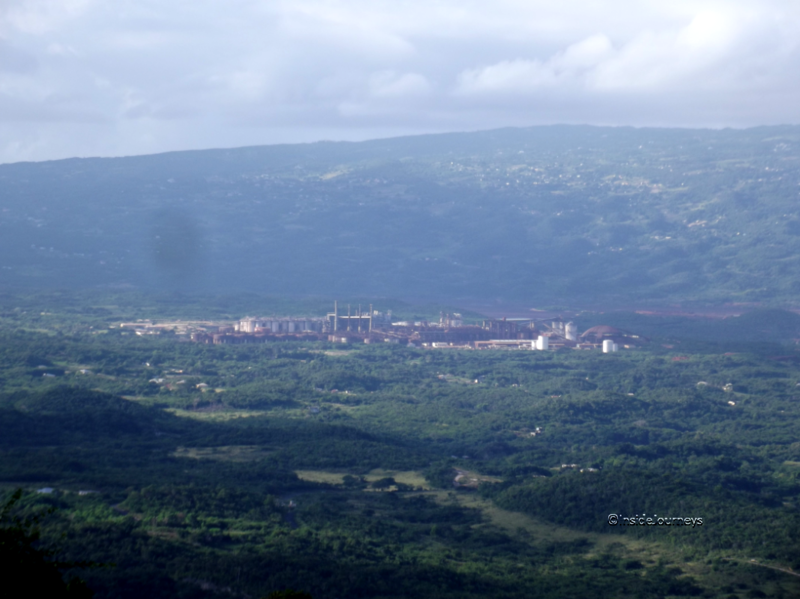 Alumina has been mined in St. Elizabeth since 1953. This factory at Nain processes 2 million tonnes of alumina each year. ′Think New York and you’ll think either theater, fashion or finance. Theater has Broadway, finance has Wall Street with its iconic bull, and fashion has Seventh or Fashion Avenue. 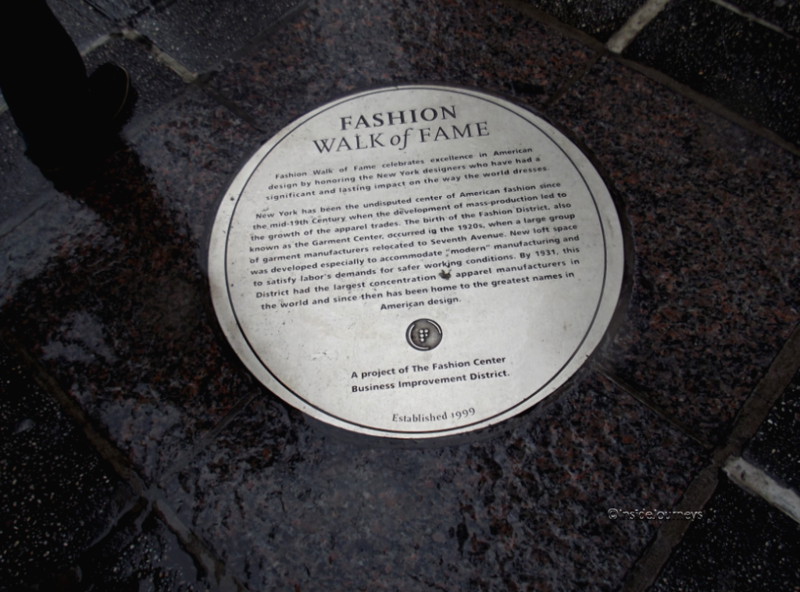 Did you know that Fashion Avenue has a Fashion Walk of Fame? Established in 1999 by the Fashion Center Business Improvement District (BID), the Fashion Walk of Fame celebrates American designers who have influenced fashion worldwide. Twenty-eight designers have been inducted into the Walk of Fame to date. Each has a bronze plaque that is engraved with a description of the designer’s contribution, and an original sketch. Each bears the designer’s signature. The plaques are embedded in the sidewalk on Fashion Avenue from 35th to 41st Street. As 2012 drew to a close, I was plagued by the notion that I didn’t do enough travelling. It was making me feel a bit regretful so I started making a list — I love lists! Sure enough, I realized I had done a lot of travelling in Jamaica and that made me smile. I had even managed to slip in a few trips to New York and Toronto. My photos helped to bring back memories of each place I’d visited, the people I’d met and the experiences I’d had. In the end, I realized that it wasn’t a bad year of travel after all. Rum has become my drink of choice and in 2012, I was fortunate to visit Appleton Estate, the undisputed home of rum, twice. While the first visit was an amazing experience (we were offered rum punch and 13 rums to sample! ), on the second visit, I joined the Jamaica Rum Society on a deluxe tour that came complete with a complimentary bus, tour guide, and bartender who served us sandwiches and as much Appleton Estate Extra and the Master Blender as we could handle. On arrival at Appleton, we were welcomed with complimentary breakfast. 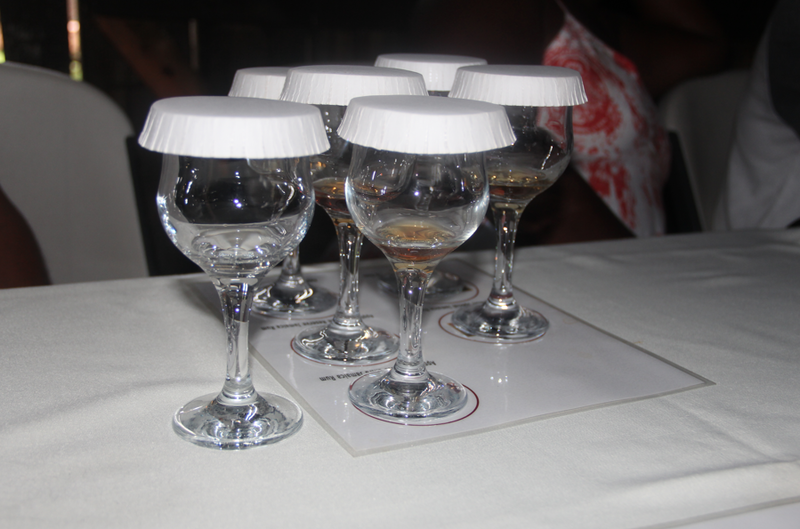 We did the usual tour but at the end, we had a private tasting with four premium Appleton rums. Afterwards, we were certified as Appleton rum ambassadors. In 2012, Jamaica hosted a year-long celebration of her 50th anniversary of independence from Britain. 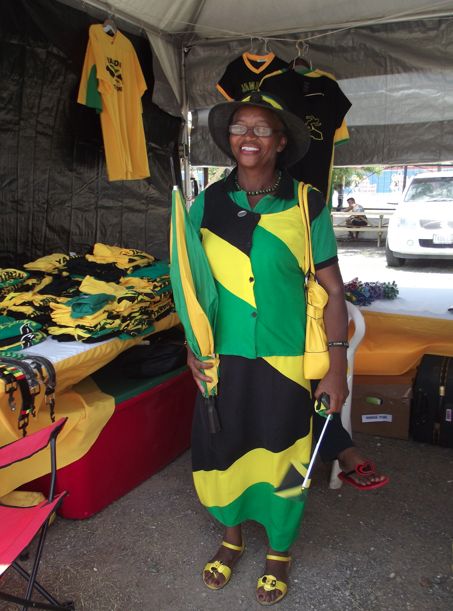 In August, I took these photos at the Independence Village that was set up at the National Stadium in Kingston. 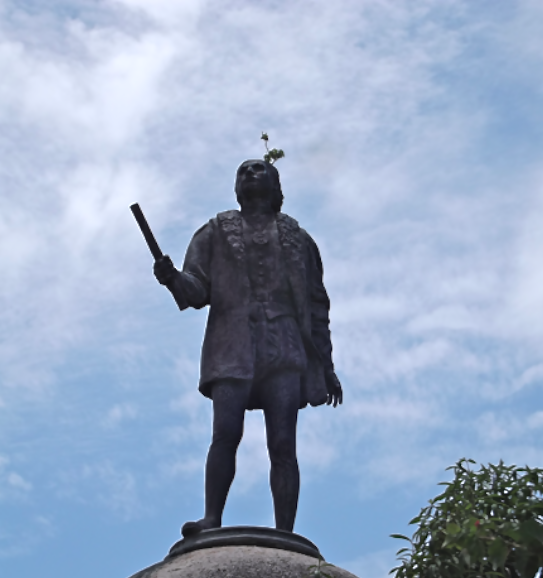 In St. Ann, my cousin pointed out this statue of Christopher Columbus, near Seville – the place where he landed when he arrived in Jamaica in 1494. 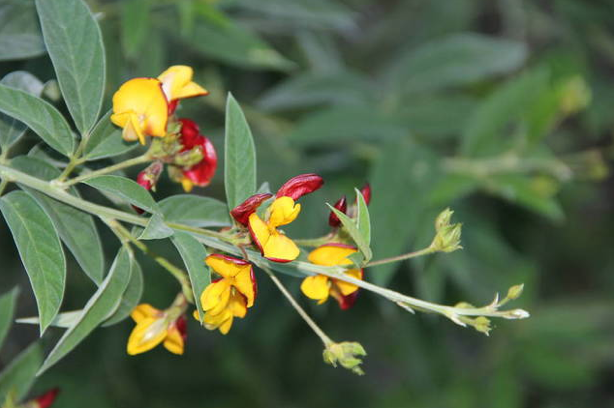 One of the sure signs that Christmas is around the corner is the flowering of the pigeon peas. Also known as gandules, they are called gungo or pigeon peas here in Jamaica and are the essential ingredient in the rice and peas dish most families prepare on special occasions and, in particular, on Christmas Day. The pigeon pea originated in eastern India and was brought to east and west Africa, and eventually to the Americas by African slaves probably around the 17th century. It has been cultivated for at least 3,500 years. Small in size and light green or white in color, the pigeon pea takes on a light brown hue when it’s been dried. Besides its use in rice and peas, pigeon peas can also be used in soups. Pigeon peas are rich in protein, fiber and essential amino acids. 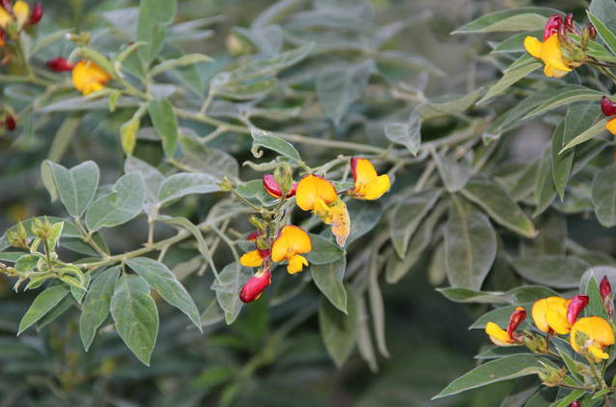 What fascinates me about the pigeon pea is the plant. The leaves look velvety and the ‘flowers’ are so colorful, they look as if they could be cut and put in a vase. These ‘blooms’ will last about a week then will be replaced by pods that are long and have individual pockets that hold each pea. Each pod can hold up to 8 peas, and grow in bunches of 5 to 7. The green pigeon peas can be frozen for later use. When cooked, they have a slightly different taste from the dried ones. Have you tried pigeon peas?